MEDALLION: Marbleized serpentine hand carved medallion representing two phoenix birds (Chinese love birds) in profile. 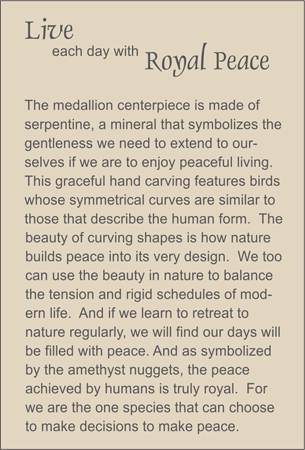 ACCENTS: Amethyst nuggets and smooth rock quartz crystal ellipses. COMMENTS: Peace is a human virtue that outshines the purple of crown royals.